He enumerated the conservative groups interested in this “con-con” are the Convention of States, Compact for America, Balanced Budget Amendment Task Force, Middle Resolution, and other individuals interested in addressing what is wrong with America. Shaw mentioned many groups and individuals on the left equally interested in amending or potentially replacing the existing Constitution such as “Code Pink, Alliance for Democracy, Wolf Pack, Center for Media and Democracy, Independent Progressive Politics Network, Vermont Single Payer, Sierra Club, MoveOn.org, occupy groups,” and some billionaires. Are there flaws in the Constitution? Why do we need to amend it in order to rein in an out-of-control government? What “magic language would an amendment adopt,” wondered Mitchell Shaw, in order to force Congress to abide by the Constitution that they are already ignoring? In his opinion, there are no flaws in the Constitution. Congress is ignoring it and American citizens allow it because they are too ignorant of their own Constitution. An amendment is not the solution, Shaw said, the solution is the creation of an informed electorate that understands the power of the state legislators to rein in the federal government. Unfortunately states compromise because they have become dependent on federal money to pay their bills. Dr. Edwin Vieira, a Constitutional scholar, summed up the Constitution convention in three words, “imprudence, incoherence, and irrelevance.” He made the most important point of the evening that any kind of amendment, agenda, proposal, or draft are irrelevant in light of the looming national debt which is impossible to repay or manage currently or in the near future. Dr. Vieira believes that the Constitutional convention will not happen before “these monetary and geostrategic events come to fruition.” “The Ship is going to come down first,” he said, referring to the irreparably damaged ship of state. 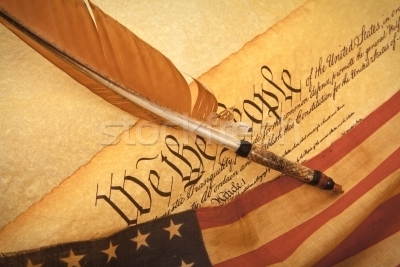 Preserving the original Constitution is most important. How long would an amendment take to pass if that is the only intent? Quoting Oswald Spangler and his “Decline of the West,” Dr. Vieira said that the “Untergang” (fall, downfall, doom) of the West will occur first. “The amendment might pass after the Carpathia shows up,” he concluded. This entry was posted in Constitutional Convention and tagged Article V, Con-Con, conflict, constittuaion convention, Constitution, downfall, economy, forum, money wars, West, WWI by Admin. Bookmark the permalink. This is “busy” work. Our Constitution is in good shape and it just needs to be enforced. Those in office know nothing about our Constitution or all the amendments to it and that ought to be change. In order to run for office all candidates must have had studied and been tested on the Constitution. Much the same as attorneys have to be tested to pass the bar in each separate state. I agree with C.A.Miller. However, the test on the Constitution should be a very public one — online or on screen and there must be a consequence to a failure such as NO ADMITTANCE TO THE ELECTION UNTIL TEST IS PASSED. All proposed legislation must cite the section of the Constitution used for such legislation and then an explanation of why it applies to that section before voted upon. All votes must be visibly recorded on screen by each legislator. Thank you for posting this and for a good summary. Since legislators fail to honor their oath of office to abide by the Constitution the problem is with the legislators not the Constitution. The solution is to replace the legislators not the Constitution.